A road trip in South Africa is the ideal way to explore the country. South Africa has a good infrastructure of roads and plenty of sights to during a long road trip. For us, it was our first introduction to Sub-saharan Africa and our first destination to go on safari. We arrived in South Africa bright-eyed and excited to embark on an epic South African road trip. The Cape of Africa contains vast and diverse landscapes that are unlike any other place on earth. 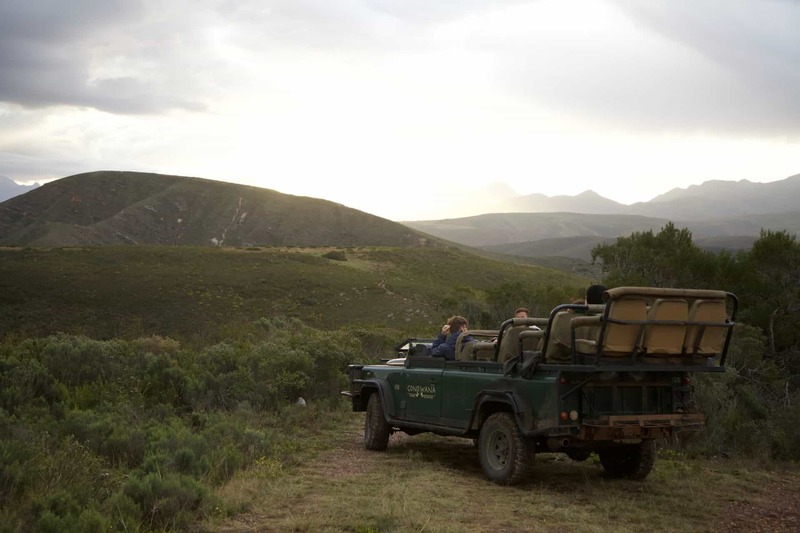 In Kruger National Park we spotted lions and elephants, the Drakensberg Mountain found us peering over 3,000-foot cliffs, and Hermanus brought us face to face with great white sharks. There is so much to see in South Africa that even with three months it’s unlikely we ever stood a chance to see it all. In this South Africa road trip guide, we’ll hit the main points of interest. We suggest you pick and choose what is of most interest to you, in the amount of time you have! We found Hertz and Avis to be the most affordable for a long-term rental, but had the best experience was with First a Sixt affiliate. We also tried out Rent-A-Cheapie in Cape Town and had a mixed experience with them. Read more about renting a car abroad and compare car rental prices here. If you want a new experience camping in Africa is a fantastic way to explore. Happy Campers have now launched a branch out of Cape Town. Check them out! We partnered with Happy Campers in Iceland and had a fantastic experience. 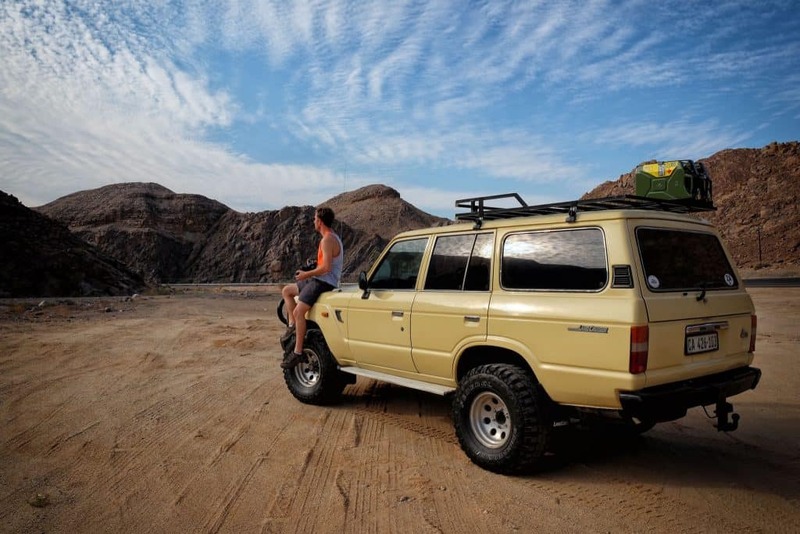 An extremely popular way to explore Southern Africa is by renting a 4×4 truck. Not everyone has the time, patience, or want to purchase a truck like we did, so you have companies like Bushlore that rent out fully kitted 4×4. If you plan to drive into the real African bush like Botswana or Mozambique this is the way to go but prepared to spend money as the rentals are expensive. We didn’t need a four wheel drive vehicle anywhere in South Africa. $15 ZAR a liter ($1.10 a liter or $4.15 a gallon) at the time of writing. We always pick up a local SIM card when we arrive in a new country. It’s always a good idea to have a working phone in case of emergencies. We picked up a SIM card with Vodacom and we were able to top up our phone from their website with a credit card. That way we always had data to run a GPS from our smartphone. Google Maps is a good GPS option in South Africa and you can download the map right to your phone for future use. Most trips to South Africa will start and end in either Johannesburg or Cape Town. Ours began in Johannesburg on a bright and sunny winter day and we were eager and ready to explore. It was our first time to Africa and we were excited to road trip around South Africa. The two main cities also have a large supply of rental cars so we were able to get an affordable rate for our rental car, we paid $600 for 30 days for a Toyota bakkie. Once you have your car it is quite easy to get around the city. There are so many things to do in Johannesburg. A guided tour around Soweto is a popular option. Another good option is to head to the Market on Main. The market on main was the top thing that our Airbnb hosts recommended us to do on Sunday mornings between 10 and 3 in downtown Jo-burg. We had a great time eating local food, soaking up the sun on the patio, and checking out local artisans. Insider Tip: Johannesburg is not that safe, especially at night. We recommend you avoid nighttime driving as car jacks are frequent in certain areas. With any road trip in South Africa, a self-drive safari in Kruger National Park is a must. Kruger National park is about a four-hour drive from Johannesburg. It’s the largest park in South Africa and is home to the big five animals. Not only is it perfect for safari, but we found it to be the easiest park in Africa to self-drive. Roads are paved, well signed, and a safari here is affordable – heck there is even a Mugg & Bean inside the park! It’s a tremendous budget option for backpackers or those on a tight budget as it can be on your own without a guide. The park is huge so I would recommend at least two or three days to get the most of it. You have a few types of accommodation in the park – high-end lodges, parks managed affordable and adequate accommodation and campsites. Booking in advance is highly recommended all types of accommodation especially in the high season. Our first day in Kruger National Park (and third day in Africa) we saw all of big five animals, it was amazing! 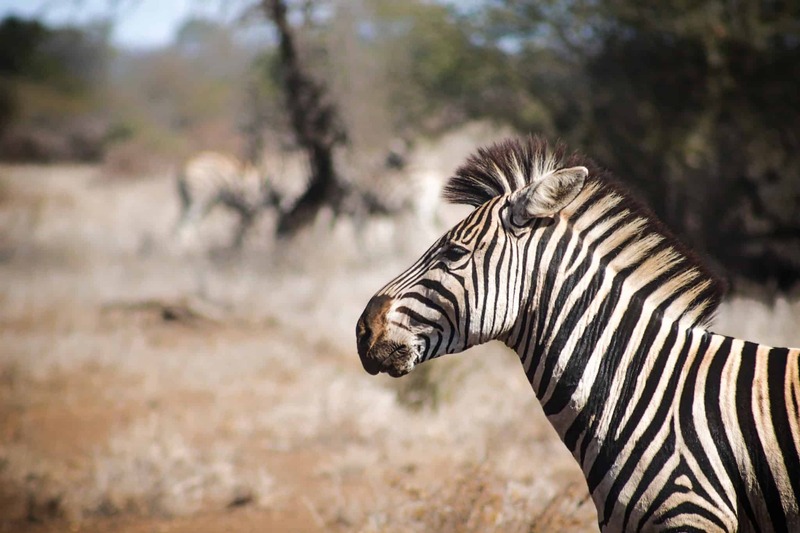 Top Tip: There are other popular things to do around Kruger National Park. 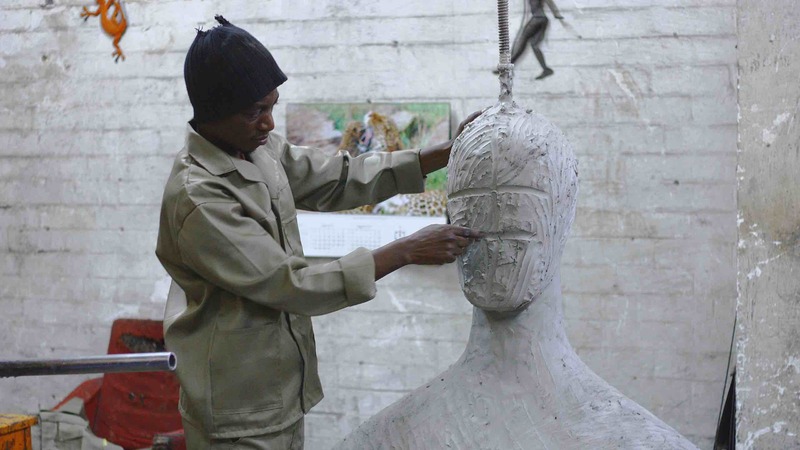 Two options are to visit the HESC Cheetah project and Moholoholo Rehab center. If you want to cross another country off your bucket list then we would suggest you head into the tiny Kingdom of Swaziland. The Kingdom of Swaziland is a landlocked country in Southern Africa between Mozambique and South Africa. If you are looking for a reason to include Swaziland on your South African road trip consider this: Swaziland is one of the last absolute monarchies in the world. Yes, a real king rules Swaziland. 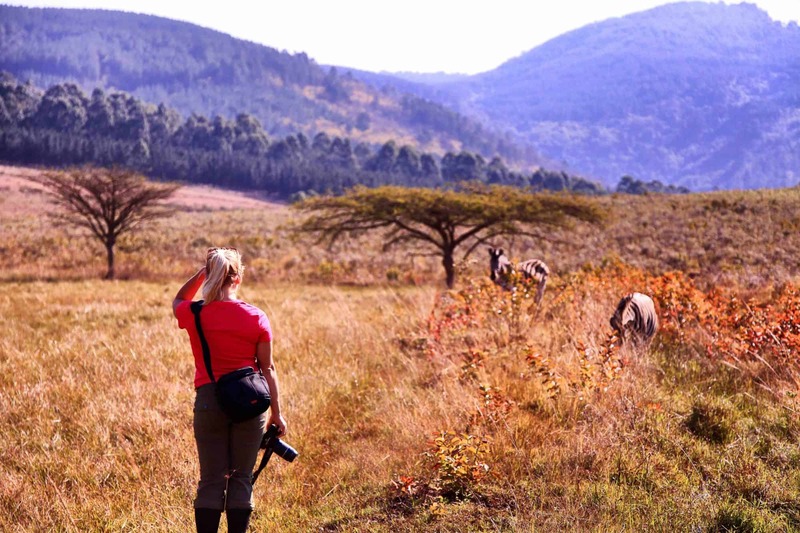 You can easily go into Swaziland for a day or two and enjoy a hike up Sibebe Rock, attend a concert and a sundowner at House on Fire, or go on an unguided walking safari in Mlilwane Wildlife Sanctuary. We spent a week in Swaziland because we had friends in the country, but I think you could make the most of it in a few days. Some things to note about Swaziland is that their currency, the Swazi Lilangeni is pegged 1:1 with the rand and prices are about the same as in South Africa. Americans can access Swaziland visa-free and we found the border to be one of the easiest we traveled to in Africa. Always check with your embassy to see visa regulations. Top tip: It’s important to check with your rental car company about the drive across borders. Some may charge a fee to do this, while others include it in their rental contract. Durban is the largest city in the KwaZulu-Natal province. If you are into big cities with a side dose of Afro-Indian culture you may enjoy a stop here. It’s true that more Indians reside in Durban than any other country in the world (besides India). That means that they have the best Indian food and curries in the country – hands down. Durban also has “The Golden Mile,” the nickname for the beaches near downtown that stretch along the Indian Ocean, and is great for surfing and windy beaches. I wouldn’t say Durban is a must add to your South African road trip, but it’s definitely a fun and thriving city that makes for a good place to stock up on supplies, hit up some restaurants, and have a coffee on the beach. 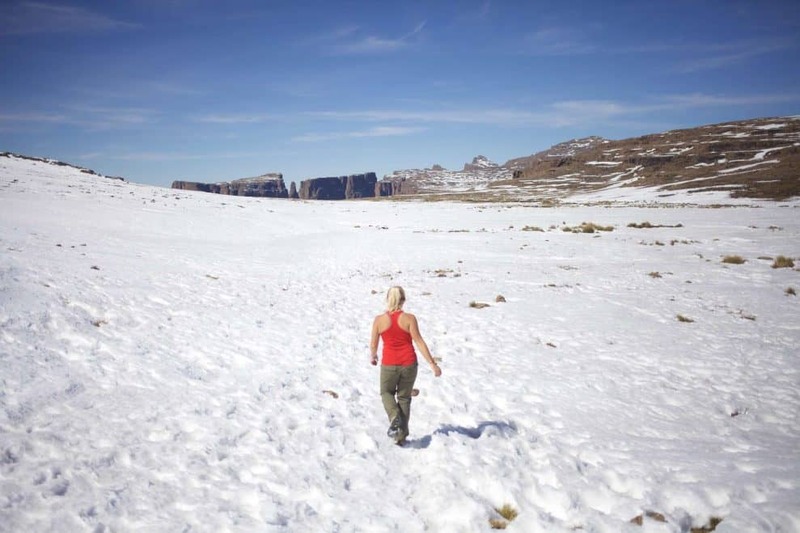 Clarens has been voted the best small town in South Africa, and once you get there you’ll see why. The lovely town sits at the foot of the Drakensberg mountains. It’s affordable, charming, and has everything you could hope to find in a small town including a brewery and coffee shop. The town’s nickname is “The Jewel Of The Free State,” and it’s in close proximity to the Golden Gate Highlands National Park. It’s one of the most beautiful parks in South Africa. The park only has some large antelope so it’s safe to go practice outdoor sports without being prey. Popular activities in the park include horseback riding, mountain biking, and hiking. 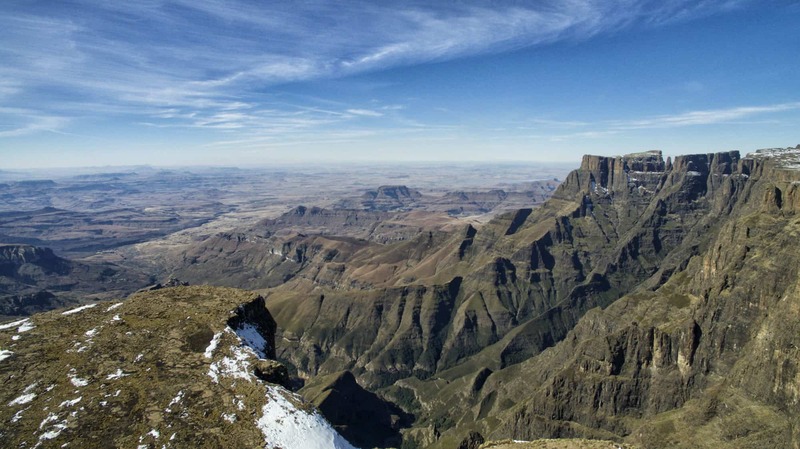 Our highlight of the region is a hike up to Sentinel Peak situated at the top of Drakensberg amphitheater. The hike is a full day adventure and not for the faint of heart. Seriously, the hike is hard and dangerous, especially in bad weather conditions. You have to freely climb two chain ladders on a cliff face over 100 meters to get to the top, but the view is one of the best in Africa and the hike is a day-long adrenaline rush. My tip: Start your hike early and go prepared with enough food and water to get you through the day. Check in with the guys at the entrance and sign out when you are done with your hike. Hidden within the Drakensberg mountains lies The “Kingdom in the Sky.” Also known as Lesotho, it is a small country in South Africa. Interestingly enough it’s considered the highest country in the world as it is entirely 1000m above sea level. 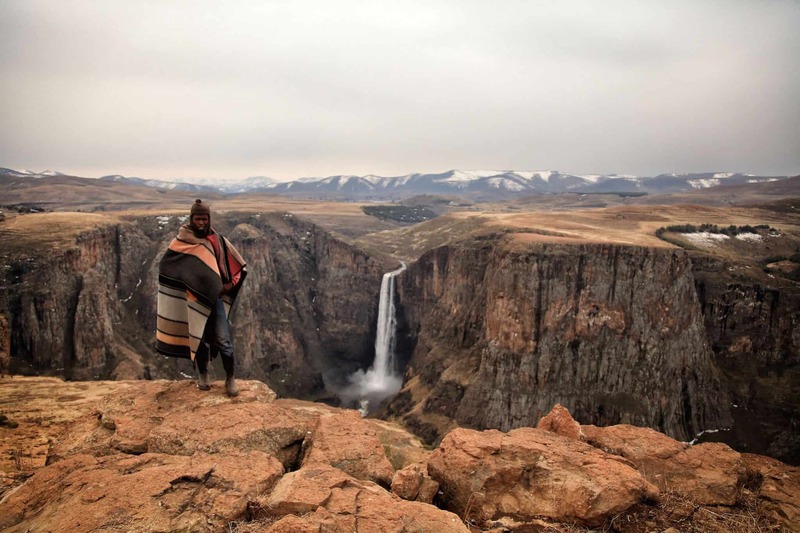 Lesotho is a hidden gem within South Africa that near enough people take the time to explore. It’s people, mountain landscape, and culture are unique and can be found nowhere else in the world. We enjoyed several days exploring the country and wished we had allocated more time. Some fun things to do are to skiing at one of Africa’s only ski resorts (you read that right), Maletsunyane Falls, hundreds of hikes, and pony trekking through the mountains. However, Lesotho’s greatest draw is the ability to explore places few have been before you. Good to know: The Lesotho Loti is another currency pegged 1:1 with the South African Rand and prices are comparable to South Africa. Again, the border crossing here is extremely simple and we did not need a visa. Check with your car rental company to make sure you can cross borders. The Wild Coast is considered by many a gorgeous region of South Africa. It extends from the Eastern part of the KwaZulu-Natal to East London. The coastline is a series of dramatic cliff faces, lush landscapes, and stunning beaches. After Lesotho, we made our way to the coast to relax on the beautiful beaches. During apartheid, most of the region was politically and economically independent, which now makes it one of the poorest areas of South Africa. It is a stark contrast to the rich cities of Johannesburg, Cape Town, and Durban. In comparison to the rest of South Africa, tourism is low and the infrastructure is poor. To explore the area we suggest planning and booking ahead specifically for guesthouses as rooms can fill up fast. Notable places to stop are Coffee Bay, Cinsta, Morgans Bay, and Mthatha. Have you seen the iconic movie, Endless Summer? The one where two surfers go chasing an endless summer in a few African nations like South Africa, Senegal, Ghana, and Nigeria. Well, one of the locations they surfed at is Jeffreys Bay. This bay is known as the “The Surf Mecca of the World” so if you are a surfer or interested in trying surfing Jeffreys Bays is your spot. The whole area is famed for it’s pristine Blue Flag Beaches, ideal for a leisurely afternoon sunbathing sesh. The Garden Route is a 300-kilometer stretch that begins at Storms River in the Eastern Cape and stretches along the coast to Mossel Bay in the Western Cape. You technically could drive South Africa’s Garden Route in one day, but we would not recommend that! You should savor it and take your time. It’s one of the best drives in the world so rushing would be a shame. Tsitsikamma National Park is a coastal park with green forests and rocky death-defying shores. If you want to be outside and in nature then stop here for a day hike or to get on the mountain bike trails. Nature’s Valley is a small town along the Garden Route most famous for the Bloukrans Bridge bungee jump. 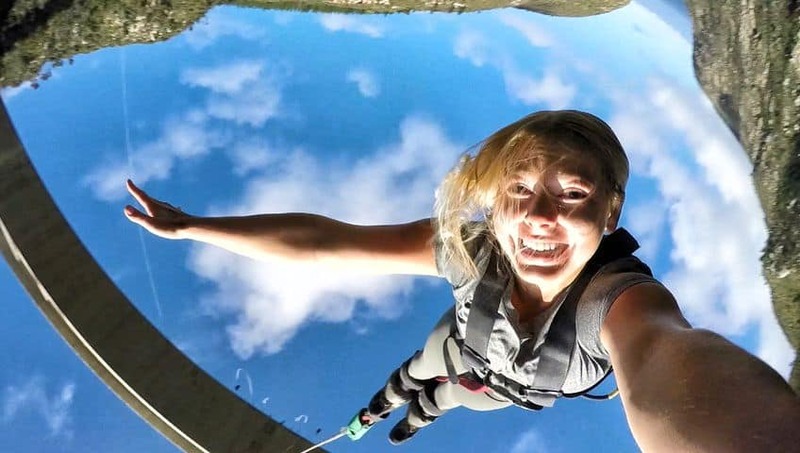 Since 1997, Face Adrenalin has been throwing people off this 215-meter high bridge. This makes it the highest bungee jump bridge in the world and there was no way we were going to miss out on that. If a bungee jump is on your bucket list then this is one of the best places in the world. If you’re not into heights there are other things to do in this small town that make it worthy of a stop. Consider hiking the Kalander Kloof Hiking Trail, going to Natures Valley beach, or having a coffee at the Natures Way Farmstall. We were in need of some TLC after a few weeks on our South Africa road trip. We made the decision to stop in Knysna for a few days to regroup. Knysna is a charming little seaside town that’s great for relaxing. However, I have to admit the real reason we stopped here was for the oysters. There are also hiking trails in the mystical Knysna Forest. If you would rather a nice easy walk I suggest grabbing a cup of coffee and heading straight to “The Heads” for sunset. Mossel Bay is a harbor town along the Garden Route. It has sandy beaches to enjoy in the summertime and an array of an adventure of activities. Mossel Bay is a good stop along the Garden Route if you are looking for any handicrafts, a good bite to eat, and just to get out and enjoy the fresh air. We stopped here along our South African road trip to go to Gondwana Game Reserve for a five-night safari in their eco camp. This was one of the most affordable safaris we had in all of Africa and I highly recommend it if you are in the Western Cape. 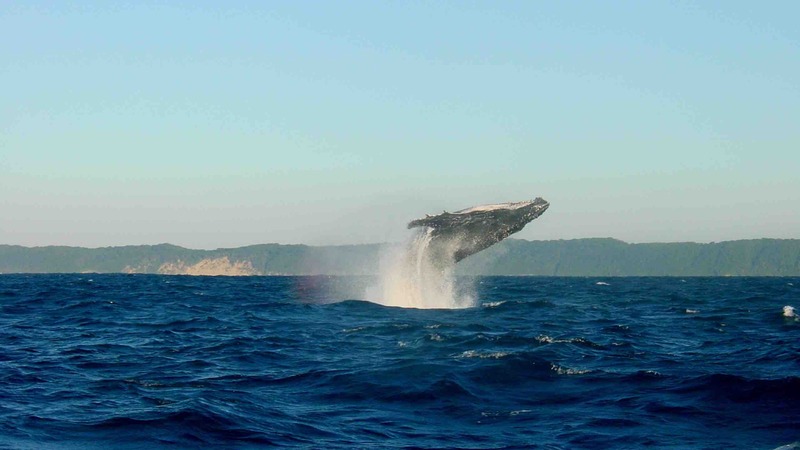 Hermanus is the whale watching destination in South Africa, and being less than two hours away from Cape Town it is accessible. It’s also where you can go cage diving with Great White sharks if that is something you want to fit into your South African road trip itinerary. We made our way here when we were based in Cape Town; however, I wish we would have just hit it on our way down the coast to save time and gas. Nevertheless, it’s still a worthwhile stop if you want to get out in the water or take to the trails and hike among the unique fynbos in the Western Cape. 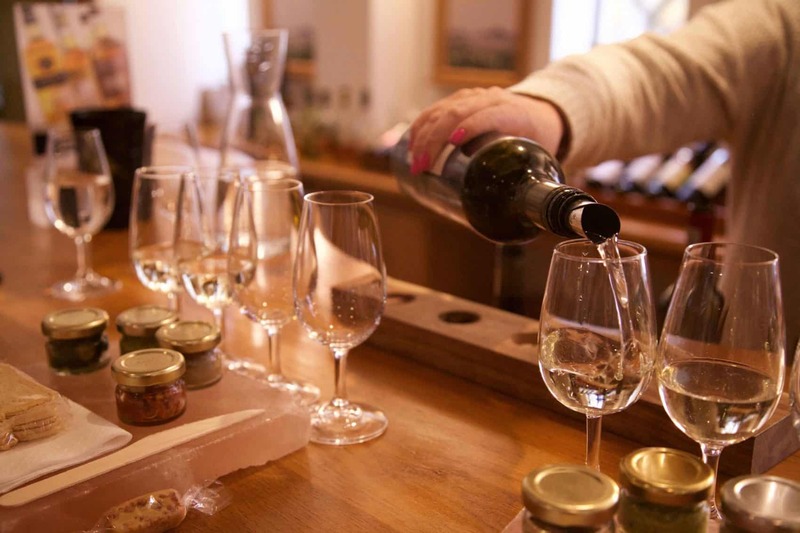 Just a 45-minute drive away from Cape Town lies one the best wine regions in the world and to travel all the way to South Africa and not include Stellenbosch in your road trip would be a mistake! Stellenbosch is a hip city in the Western Cape. There’s a nice downtown area with plenty of nice bars, restaurants, and cafes to relax at. However, that’s not the claim to fame. Did you know that South Africa produces over 959 million liters of wine each year, making the country the seventh-largest wine producer in the world? Over 200 of those wine producers are in Stellenbosch. So if you enjoy good wine at an insanely cheap cost (like $6 a good bottle cost) then make a pit stop in Stellenboach and go on some wine tours. Their signature blend is Pinotage, a red wine grape variety. Stellenbosch is also surrounded by mountains so once you drink all that wine you can head out to go hike and work it off! I would suggest two to three days for Stellenbosch. When we mentioned to a fellow South African that Cape Town would be our last stop on our South Africa road trip he said, “Well, sounds like you’re saving the best for last.”! While everyone’s opinions may differ on Cape Town it actually turned out to be our favorite stop in South Africa, and one of the coolest cities in the entire world. Table Mountain is a part of the city and visible from almost everywhere in the city. Across from Table Mountain is Lion’s Head, and both are popular for a hike and an evening sundowner. 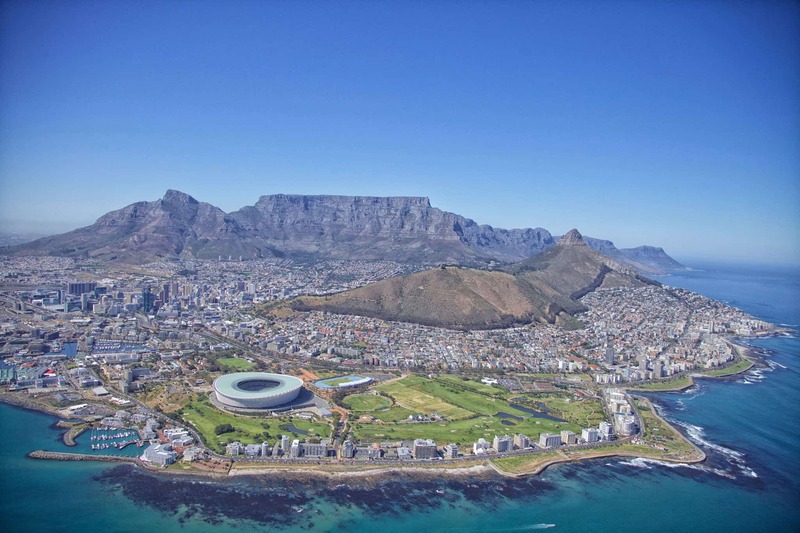 There are dozens of things that to do in Cape Town and the Cape Peninsula. A highlight of any trip has to be Cape Point, where you can marvel at the mountainous and scenic surroundings. You can check out the penguins at Boulders Beach, go snorkeling with seals or stroll around colorful Bo-Kaap. Cape Town is the perfect mix of adventure and leisure mixed with hip coffee shops and restaurants.